Hollywood, CA…“Blood lost. Life found,” goes the tagline for The Revenant. As the titular character quickly discovers, however, what is found is not truly life, but a strange sort of waking dream—one that is alternately beautiful and stark, but ultimately lacking complexity or any deeper message. Unfortunately for viewers, they may feel the same way about the film as they sit through the ending credits. 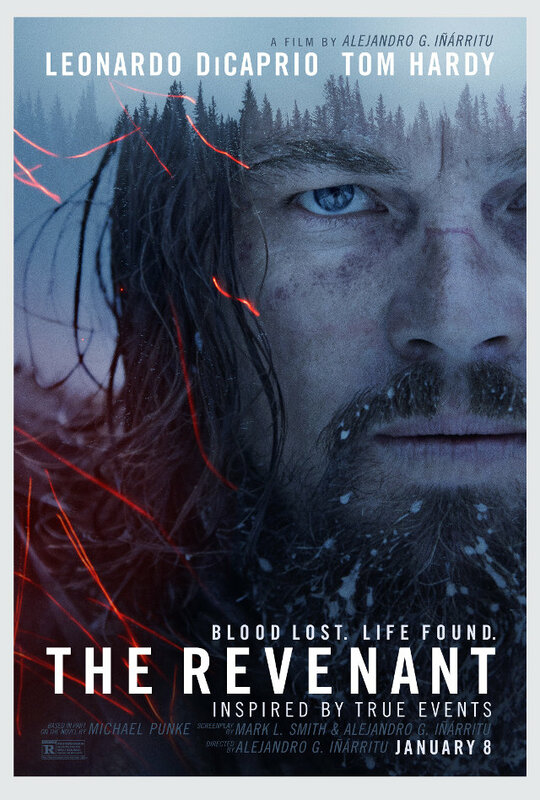 Alejandro González Iñárritu’s follow up to his 2014 Oscar-winning picture Birdman, The Revenant is the story of Hugh Glass, a frontiersman, trapper, and hunter. Loosely inspired by the true story of Glass, the film opens in 1823 in the uncharted wilderness of the Louisiana Purchase, with Glass and his half-Pawnee son Hawk under the command of Captain Andrew Henry (Domhnall Gleeson, fresh off The Force Awakens), who is leading a quasi-military fur trapping expedition. Things go south when a party of Ree tribesmen, who are searching for their chief’s missing daughter, wipe out most of the men. The situation then goes from bad to worse when Glass is mauled by a mother grizzly while scouting a path for the survivors (incidentally, this scene features what is perhaps one of the most fake looking animals in cinema in the form of the computer generated bear). Suffering from his wounds, Glass is left behind under the care of the amoral John Fitzgerald (Tom Hardy). In short order, Fitzgerald attempts to expedite the process by murdering Glass, but when he fails, he kills Hawk and leaves Glass to die. Unsurprisingly, Glass survives, gruesomely stitches up his wounds (going so far as to cauterize his own neck), and sets out to track down Fitzgerald and take revenge. If there is one reason to go The Revenant, it is Leonard DiCaprio as Glass. Bearded, dirty, and bloodied, DiCaprio—who went through most of the scenes in reality, enduring freezing temperatures and more—plays the frontiersman with minimal dialogue, speaking only a handful of lines throughout the film. Instead, Hugh Glass is a man driven by grim purpose, one who lets his actions speak for him. DiCaprio is incredibly expressive with his eyes and body language, and as a result the audience experiences his anguish, determination and loneliness firsthand as he treks through the uncharted vastness. He even manages to express a bit of humor during one scene that really adds depth to his character. If you need another reason, there’s the cinematography. The camerawork, by Iñárritu and cinematographer Emmanuel Lubezki, is absolutely stunning. Shot in all natural light and on location, the mountains, forests, and rivers that form the wilderness of 1820s America are striking. Frequent wide shots, often with Glass framed as a tiny figure against the vast distance, show off the grim landscape and the natural beauty. Drifting snow, clouds against the sun, and trees blowing in a cold wind are all simple images that add to the isolation and really makes the audience experience the visceral punishment that Glass undergoes—the film will make you feel cold just by watching it. The minimalistic score, composed by Japanese musician Ryuichi Sakamoto, and the excellent costumes and makeup also add to the detail, which ultimately shows a world that is cruel and unforgiving. The story is serviceable, but it lacks depth. Retaliation is motive enough for Glass to put himself into one life-threatening situation after another, but after watching our protagonist do everything he has to in order to survive for an hour of the film, one becomes desensitized to it, and as such these scenes become a chore to sit through. Ironically, the death of his son actually lessens the film somewhat. The main problem is that the film wants the audience to feel Glass’s loss, but without devoting any time to establishing his relationship with his son, the man’s pain lacks emotional weight. Glass did not have a son in reality, and in the film it could be argued that would have had more than enough desire for vengeance against Fitzgerald after being left for dead. In light of this, the subplot concerning Hawk, combined with the frequent flashbacks explaining Glass’s backstory, all feel like unnecessary padding, as the scenes with the Ree, who serve mainly as an obstacle to propel Glass forward. The ending also feels abrupt, as though Glass has simply no motivation to go on once his task is concluded. The standout of the supporting cast is Tom Hardy, whose mumbling portrayal of Fitzgerald conceals a dark and disturbed man who is willing to go just as far as Glass to survive. Fitzgerald makes a compelling villain, if only because the majority of his actions—deplorable as they are—are understandable. Gleeson is also intriguing as Captain Henry, especially considering his over the top performance in Star Wars, and he excellently shows how tormenting a decision can be, particularly when it comes to the survival of his men. Ultimately, The Revenant can be seen as a foil to Birdman in many ways, with long wide shots as opposed to tracking ones, isolation versus crowds, and a stark and understand visual style set in a different time period. The film is certainly worth watching for the primal experience of survival and the exquisite visuals, but the story and the side characters lack the depth to make it a true classic. Perhaps that is the true meaning of the title, which refers a person that returns from death: beautiful to look at but empty on the inside, like a man made of glass.